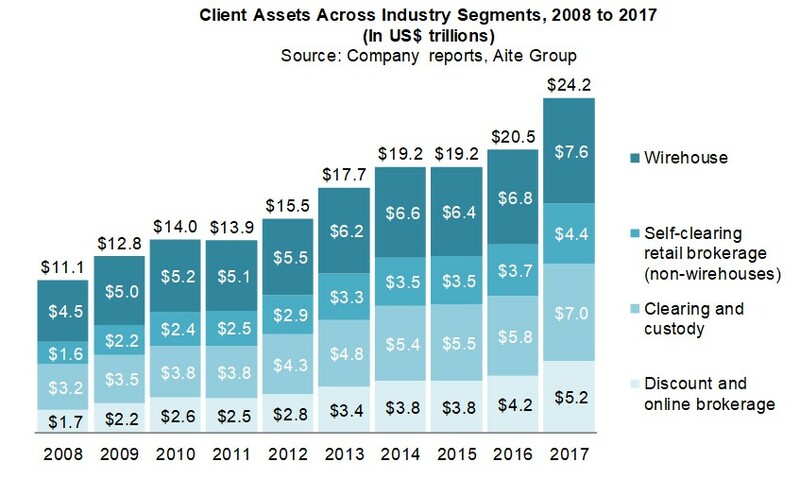 Total client assets in the U.S. brokerage and RIA markets jumped US$3.7 trillion to hit a record US$24.2 trillion at the end of 2017. Boston, July 19, 2018 – The U.S. wealth management industry has grown almost every year since 2008 in terms of total client assets, but after several years of slower growth, client assets have returned to a more normalized 9% compound annual growth rate from year-end 2008 to year-end 2017. As a result, overall growth of client assets reached 19%, a welcome development buoyed by a 22% total return in the S&P 500. This report continues Aite Group’s New Realities in Wealth Management series by segmenting the U.S. wealth management industry into four key groups (wirehouses, self-clearing and retail brokers, clearing and custody providers, and online and discount brokers) and discusses the latest findings for client assets, fee-based assets, advisors, productivity, and market share. It is based on publicly available regulatory filings, investor presentations, and news articles, and it is supplemented by Aite Group interviews with firm executives throughout 2017 and by Aite Group estimates and analysis. This 49-page Impact Report contains 38 figures and four tables. Clients of Aite Group’s Wealth Management service can download this report, the corresponding charts, and the Executive Impact Deck. This report mentions Advisor Group, Ameriprise, Apex Clearing, Appleton Partners, AXA Advisors, Barclays, Bloomberg, Cambridge Investment Research, Capitol Securities, Capital Group, Capital One, Charles Schwab, Chase Investment Services, City Securities, Commonwealth Financial Network, COR Clearing, Deutsche Bank, Eaton Partners, Edward Jones, Equity Advisor Solutions, E-Trade, Fidelity, Fifth Third Securities, Folio Institutional, Hilliard Lyons, H. Beck Inc., Hilltop Securities, Interactive Brokers, INTL FCStone, ISM Capital, J.P. Morgan, John Hancock, Kestra Financial, LPL Financial, MassMutual, Merrill Lynch, MetLife, Morgan Stanley, National Advisors Trust, National Planning Holdings, Northwestern Mutual, Oppenheimer & Co., Oxford Financial Group, Pershing, Raymond James, RBC, Reams Asset Management, Robert W. Baird, Scottrade, Scout Investments, SEI, Shareholder Service Group, Signator, Shepherd Kaplan, State Street, Sterne Agee, Stifel Nicolaus, SunTrust Investment Services, TD Ameritrade, Trade PMR, Trust Company of America, UBS, US Bank, US Trust, Vanguard, Wedbush Securities, Wells Fargo, William Blair, Woodbury Financial Services, and Zeigler Wealth Management.